What an amazing place, some 100 years ago this was the flag ship of J Lyons & Co. the teashop people. It was sold off in the seventies and remained a restaurant/bar until 2002 and then closed. Now re-opened by Charles Fontaine (formerly The Quality Chophouse and Le Caprice) it is a mixed bag. The place is huge, stretching underground from the bar entrance (pictured above) to the restaurant entrance. The whole place is like gentlemen's club, with marble staircase, beautifully tiled floor and lots of wooden paneling. But don't be fooled, it aint no gentlemen's club any more, it's seldom busy in the bar and even less so in the restaurant. There is a 'sports' room on the very lower floor. 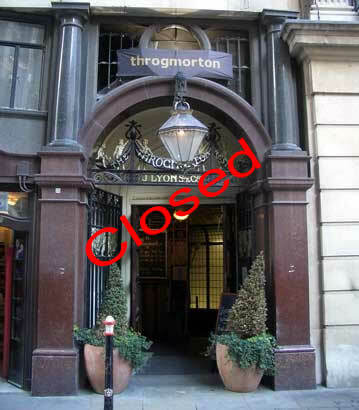 I would recommend at least one visit to the Throgmorton just for the surroundings, but be quick, I don't think it's going to be open that long.